I think the reason the husband stopped cooking for me stems back to the very early days of our relationship. I've mentioned before how I was bowled over by him wanting to cook for me on our first date and was touched that he made the effort to cook from scratch (well he used shop bought pesto) rather than just getting and M&S ready meal. A few weeks later he offered to cook me his signature dish. I was impressed. It's not to say I'd never dated anyone who could cook before - my first long term boyfriend was a whizz in the kitchen, but only at about 3am as he operates on a different time zone to the rest of the UK - but to be offered a signature dish was upping the ante a little. Or so I thought. The dish was hot pasta with mayonnaise, chicken, tuna, bacon and sweetcorn stirred in. I am totally okay with people telling me I'm fussy and ungrateful over this, but I'm sorry, I just didn't like it. See I have a problem with the idea of tuna with lots of things. For me, tuna comes as a lightly griddled steak, seasoned with black pepper and lime and still pink in the middle. Or if it's out of a tin then it should be mixed with mayo and either in a sandwich or on top of a jacket potato. If I'm feeling adventurous, then I'll have it in a pasta salad. But always with cold pasta. There's just something in my head that can't compute tuna and hot pasta. Or tuna and cheese - I'm sure tuna melts are very lovely but I'd rather fritter away my lunch choice on something else rather than risking the disappointment of not liking a tuna melt. So tonight's recipe choice was selected to try to get me to get over my fear of certain tuna dishes. Originally I'd picked up a recipe for tuna, asparagus and cannellini bean salad. It sounded lovely and seasonal until I realised that actually, it's exactly the same as another recipe I tried a while back except the green veg in that one was fine green beans. Although one was from a recipe book and one was from the Good Food website, they were exactly the same, right down to the quantity of dressing. I smell a rat here. 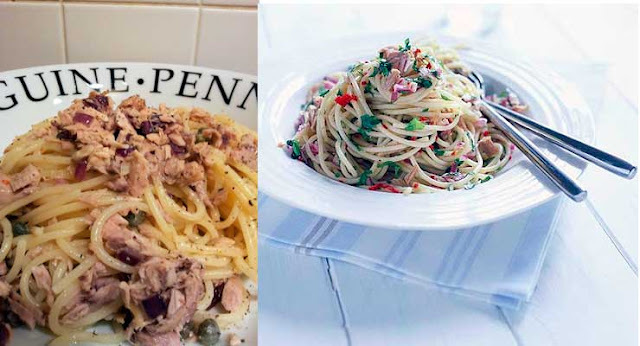 As that felt a bit cheaty, I ended up choosing this recipe which calls for hot spaghetti to be tossed with cold tuna, capers, raw red onion and garlic, chilli and lemon. I wimped out on the raw onion and garlic front and sauteed them for a couple of minutes just to take the harsh edge off of the taste. I need to make sure I overdo the mouthwash tonight and tomorrow morning so as not to offend anyone. Once served, the dish looked absolutely nothing like the picture from the website. Now I appreciate that I'm not a skilled photographer or food stylist and I don't have a photo studio to hand with which to photograph my dinner. But if you look at the two pictures side by side and read the recipe, you'll note that whilst the BBC one is artfully scattered with green herbs, the actual recipe makes no mention at all of using herbs. Nor does it mention seasoning. Which I found really helped this dish along. Guess which one had a pro food stylist? It wasn't bad and hot pasta and tuna is okay. I definitely won't make this particular recipe again as I found the pasta really bland. I should have trusted my instinct and seasoned it in the pan before mixing in the ingredients. Maybe because it's an Olive magazine recipe, they just assume that readers will automatically season the pasta and they don't need to spell it out like Good Food do for their readers. Same with the herbs. Maybe if I was clever enough to read Olive, I'd automatically garnish all my dishes with green stuff. Ho-hum. If you want to try the recipe yourself, you can find it here.